Boson Energy believes that IMPACT energy solutions need to consider not only POWER, but also HEAT and COOLING. To be truly circular in utility supply, one also needs to consider WATER and WASTE. Water use in energy generation is considerable and properly managing water and waste is the only way to reach true resilience and a truly circular economy. 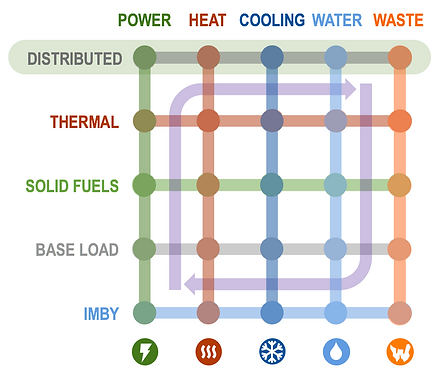 With DISTRIBUTED THERMAL GENERATION at the base; Boson and partners develop, build, and integrate complete, resilient, smart, and circular solutions for supply of utilities delivering true impact, and prosperity building in local communities. Many small commercial scale-units hooked up to interconnected mini-grids can create redundancy by design over large areas, without requiring costly and time-consuming transmission investments. This is a key advantage in situations of rapid urbanization where high energy density is required and heavy infrastructure cannot keep up with the urban sprawl. Ur in upgrade scenarios where transmission upgrades do not fit. It also reduces energy system complexity while ensuring control and energy security through local sourcing and operation. Distributed generation has an important role to play all the way from the smartest of cities to the most remote of underdeveloped areas. Bringing down scale, turns ‘excess heat’ into ‘success heat’. The 1.5+ MWth of thermal energy from a 1MWe cogeneration plant can provide onsite heat and steam for manufacturing industries or power cold storage that would boost food security and/or reduce produce wastage in a rural area considerably. Or both power and cool hospitals, data centres, and office complexes. In contrast to ‘free fuel’ solutions, biomass co-generation becomes a positive part of the local socio-economic system and improves the regional trade balance. It creates local jobs at all skill levels – from biomass supply, to operation and maintenance. And in agricultural regions it can create revenues from both crop residue problems and marginalized land. Base-load generation on small industrial scale improves energy security and can power local industries and entrepreneurs, hospitals and schools, and remote communities; in a way that intermittent generation cannot in a cost effective way. Exceptionally low environmental impact and community nuisance, in combination with the local socio-economic contribution makes solid fuel gasification one of few ‘IMBY’ energy technologies (welcome by stkeholders ‘In My Back Yard’) as opposed to any of the centralized solutions that are all opposed in a BANANA way (‘Build Absolutely Nothing Anywhere Near Anything’) - and creating very real issues with delays in permitting and committed rollout schedules. A Boson Energy Unit (BEU) is a Combined Cooling, Heat & Power (CCHP) system powered by solid fuels such as cellulose biomass, coal, or waste. Developed for the energy system of the future - including advanced final energy contracting and performance economy business models. Business case independent of feed-intariffs, subsidies, and geopolitics. Highly attractive LCoE after thermal sold. The BEU features H3TAG Gasification. High temperature agent gasification technology developed by Boson Energy SA puts key emphasis on the 3T’s of the process: Time, Turbulence and Temperature. This allows for a zero-tar gasification system with high availability, stability and repeatability, and low operating and maintenance costs. No reviews were found for Energy Solutions. Be the first to review!